JFileUpload fits to many businesses involving web uploads such photographers, printing companies, web albums, hosting services, webmasters, CMS vendors ... JFileUpload is a Java Application (Applet and WebStart) that allows end-user to upload files and folders to a web or ftp server. It could be integrated into any application. Deployment is fast and easy. Download the features matrix. 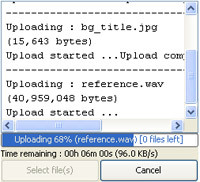 JFileUpload front-end includes a progress bar. Upload could be stopped at any time thanks to a cancel button. End-user could select file(s) to upload with a dialog box or through simple drag and drop from file system explorer. Multiple files and directories selection is allowed. Recurse subdirectories feature is available too. JFileUpload includes multilanguage support. Front-end resources (menu, text items, messages, background image, look and feel, ...) are stored in ascii files and could be modified. Image previewer could be added and colors could be modified too (see screenshots). JFileUpload supports very large uploads (more than 2 GB) with low resources (RAM, CPU) usage on client-side. It could resume broken upload, rename files before upload and ZIP file on fly. It allows to limit size (in bytes) or type (e.g. *.doc, *.exe) of files to upload. It allows to pass extra parameters (e.g. login, password, sessionid, cookie, ...) and allows post-processing by redirecting to an URL after upload. HTTP: JFileUpload sends files to a web server through standard HTTP multipart (RFC 1867) request, that's the reason why server-side technology could be Java/J2EE™, PHP, Microsoft ASP/.NET, Macromedia/Coldfusion or Perl/CGI. For Java/J2EE server-side script, we recommend JSPUpload to process upload and store files in folder or database. JFileUpload also supports HTTP PUT. Note that HTTPS (HTTP over SSL) is supported too. FTP: JFileUpload sends files to a ftp server after being authenticated (anonymous or user account). Note that FTPS (Explicit/Implicit FTP over SSL) is supported too. SFTP support is available here and SCP support is available here. JFileUpload works under most operating systems such as Windows, Linux and MacOSX. It has been tested with Internet Explorer, Safari, Firefox, Opera and Google Chrome. See documentation for all platforms validated. JFileUpload API is flexible. It is designed to integrate new front-ends, plug custom filter, pass extra HTTP parameters, support cookies and session, proxies, support authentication ... However, this feature is only available in JFileUpload enterprise and premium packages. JFileUpload can run as applet in browser, as java webstart (deployed over HTTP and launched through a shortcut on desktop) or as stand alone java application. See online documentation for JFileUpload installation and samples. It includes all parameters description for both HTTP upload and FTP upload. FAQ is also available. You can try JFileUpload applet here. It allows to upload 1 to 3 files (50MB size max) over HTTP.